Don't you enjoy finding healthier and fun snacks for your family? I do! I had the opportunity to sample a few delicious snacks from the Pirate Brands line. Not only are Pirate Brands snacks delicious, they are also healthier than some of snacks on the market today. UPS arrived in my driveway and my son ran out to grab the packages I had waiting for me. One happened to be the samples that I've been anxiously awaiting. When I opened the package, I found a cute pirate's chest filled with goodies, ink pen, chip clip, and temporary tattoo's. It was time to get down to business and sample the goods inside...well, after my son immediately claimed the pirates chest, lol. I remember when I was a young girl and my mother would purchase snacks in the rice cake area. The snacks were awesome! Unfortunately, I've never found them for my own family and believe me, I have been searching for them. Pirate Brand snacks are the next best thing if not better! These are also very welcoming with the fact that we are over-run with Girl Scout cookies at the moment since my daughter is in the Girl Scouts pushing cookies on everyone! Good, crispy snacks when you are looking for an original flavor. I'm trying to figure out what I can compare the taste to. Possibly corn chips but, these are not as hard as corn chips and less salt! New York Pizza had a light seasoning similar to the pizza chips available in the stores. They were puffy and the first thing my daughter thought was "popcorn". However, they do not look or taste like popcorn. I enjoyed this flavor but, apparently not as much as my son who devoured the entire bag! I'm going to be honest, I liked these the least out of the snacks. As with any Salt & Vinegar snacks, you must have an acquired taste for them. While I do enjoy some Salt and Vinegar chips and though these have a lighter taste than most, I didn't care for them too much. However, my son enjoyed this flavor. Normally I don't buy too many veggie flavored snacks because, I fear they won't taste any good. These are great! The veggie seasoning is just right and an original flavor comes through for a pleasurable taste. I need to remember not to "knock" veggie flavored snacks in the future! Mmmmmm, you know the slogan "Can't eat just one" from a popular brand of potato chips? These definitely fit that slogan! There is a perfect blend of spices to bring out the sour cream & onion without being overpowering as some chips are. Loved em'! This is one of the flavors that I couldn't wait to try. I love cheese flavored snacks and the Aged white cheddar has a perfect blend of cheese seasonings to tease your taste buds. Be careful, you'll devour the bag before you know it! Another flavor I enjoy eating is BBQ flavored chips. This BBQ flavored bag of snacks vanished before anyone knew they were gone. How? 3 of us ate this one serving sized bag, lol. The seasonings are great! I'd slightly add a tad more BBQ to these snacks if I were the creator but, otherwise I loved them. I saved the best for last! These puffs remind me of the major cheese puff brand with the exception of these being a different flavor. This snack beats the major brand hands down. Try them for yourself, I hope you agree with me! If not, my address is .....lol, ok seriously I loved this snack the most. One added bonus of Pirate Brand snacks would have to be when I turned the bag over to read the ingredients. I couldn't believe that I actually understood everything listed. These snacks are all natural and they are baked, not fried! I think you would also enjoy the pictures and sayings on each bag. Now my son is going around reciting the line "Shiver me timbers", lol. Cannot wait to find out if you are the lucky winner and want these snacks now? No problem! Find a store near you with this handy Store Locator. No store's near you? Again, not a problem! Just share in a comment below, what is your favorite snack and the flavor of snacks you can't wait to try. Enter Here http://tinyurl.com/yeg62rb & RT @mrsmiki77 to win Pirate's Booty! Disclaimer: I have not and will not be paid for this review. I have received a sample of snacks from Pirate Brands.I have only posted my own personal opinion to share with other readers. I contacted Pirate Brands who offered to sponsor this giveaway. I hold no responsibility between you and the company, and/or products you may purchase or receive from them. The Pirate's Booty Aged White Cheddar seems like it'd be delicious! Id like white cheddar. Thanks for the chance. My favorite is popcorn. I would like to try the Aged White Cheddar Pirate's Booty. My favorite snack is coincidentally popcorn, especially this white cheddar popcorn that Utz makes in a dark blue bag. It is so addicting and I absolutely love eating it. The flavor I would love to try is the white cheddar. Thanks for a great giveaway! I like pretzels and would like to try the Aged White Cheddar. I love popcorn and would like to try the Pirate's Booty Aged White Cheddar. I am following your blog via Google Friend Connect. My favorite snack is warm chocolate chip cookies. I would like to try the white cheddar. Thanks for the giveaway. Hmmm favorite snack. I'm not really sure. Probably fruit. Pirate's Booty New York Pizza is the one I want to try the most. Another favorite snack of mine is pretzels, and I'd love to try the Pirate's Booty Aged White Cheddar. My favorite snack is tortilla chips and I'd like to try the Original Tings Crunchy Corn Sticks. I really like TownHouse's new cracker Flips in the Cheddar flavor. I'd also love to try the Pirates Booty in the Aged white cheddar! I love to snack on cheddar popcorn or pretzels and would love to try their Pirate's Booty Aged White Cheddar. I'd like to try the sea salt & vinegar or the salt & pepper. This is my first visit to your site and I like it! My favorite snack has always been ant on a log! I love peanut better and the ants just make it easier to eat the celery. If I win a chance to sample the snacks I am most looking forward to trying the Sea Salt and Vinegar flavor. I just tweeted about this giveaway! My user name is kimkimfisher and here is the link. Too bad I only had 140 characters. I think this is the link that you need to the post but I am not sure. My favorite snack - Lime Flavored Tostados. I'd like to try this flavor - Sea Salt & Vinegar. My favorite snack is sourdough pretzels. The flavor I can't wait to try is aged white cheddar. my favorite snack is chocolate chip or oatmeal cookies straight from the oven. id like to try these in barbeque! My favorite snack is coincidentally popcorn, especially this white cheddar popcorn that Utz makes in a dark blue bag. It is so addicting and I absolutely love eating it. The flavor I would love to try is the white cheddar. I love Ranch Pringles...I'd love to try the White Cheddar flavor of Booty though! I like fruit but the new york pizza also sounds great! My favorite snack is chocolate. I'd like to try the sour cream & onion. I love Sea Salt & Vinegar Chips & cannot wait to try theirs. My favorite snacks are pretzels and popcorn. I'd love to try the Barbecue flavored Pirate's Booty! My favorite snack varies widely from day to day. Presently its raw pistachios. Last week it was hot tamales... I'd love to try the sea salt and vinegar chips, I think next week will be a salty crunchy week :) Thanks! i'd love to try the sea salt and vinegar!! My fav snack is fruit with yogurt dip and I would like to try the BBQ. I love anything dipped in sour cream & onion dip. I look forward to trying Wis. cheddar. My favorite snack is granola bars. I'd love to try the Aged White Cheddar. We love the White Cheddar Pirate Booty and I can't wait to try the Booty Barbecue. my fave snacks are pretzels. esp. honey wheat kind. i would love to try the pizza flavor! I love cheddar cheese so I would love to try the Smart Puffs. Thanks. I really love the Veggie Pirate's Booty and I would love to try the Sea Salt & Vinegar Pirate's Booty. 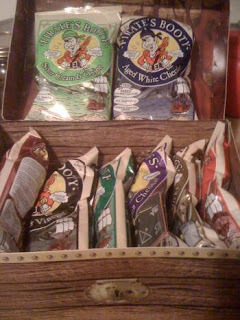 I would love to try the Pirate's Booty Aged White Cheddar, I love the taste of white cheddar snacks, thanks! I love popcorn, and I'd like to try the Pirate's Booty New York Pizza. My fave snack is popcorn. I can't wait to try Pirate's Booty New York Pizza. I would like to try the cheese puffs in the Real Wisconsin Cheddar flavor. I'd love to try the Pirate's Booty Aged White Cheddar. My favorite snack - Nuts of any kind, especially Cashews. I'd like to try - Sea Salt & Vinegar. I'm following you on Twitter (id- electricisland) & tweeted. I like Hohos; Piarate's Booty New York Pizza is my choice! One of my favorite snacks is yogurt and granola. I'd love to try the aged cheddar flavor! soft spot for chips so the sour cream and onion pirates booty sounds good and healthier. My fav snack currently is white cheddar cheezits. My favorite snack is sherbet. I'd like to try the Sour Cream and Onion snack flavor from Pirate's Booty.